The scribes and Pharisees brought unto him a woman taken in adultery; and when they had set her in the MIDST, They say unto him, Master, this woman was taken in adultery, in the very act. Now Moses in the law commanded us, that such should be stoned: but what sayest thou? This they said, tempting him, that they might have to accuse him. But Jesus stooped down, and with his finger wrote on the ground, as though he heard them not. So when they continued asking him, he lifted up himself, and said unto them, He that is without sin among you, let him first cast a stone at her. And again he stooped down, and wrote on the ground. And they which heard it, being convicted by their own conscience, went out one by one, beginning at the eldest, even unto the last: and Jesus was left alone, and the woman standing in the MIDST. When Jesus had lifted up himself, and saw none but the woman, he said unto her, Woman, where are those thine accusers? hath no man condemned thee? She said, No man, Lord. 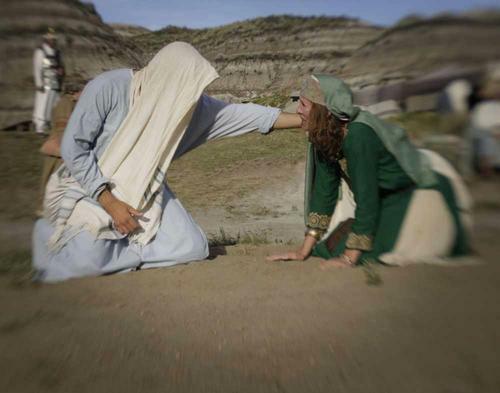 And Jesus said unto her, Neither do I condemn thee: go, and sin no more. In the beginning she was amidst her accusers but now she was amidst Jesus. When we are standing in the midst of Jesus we are in the midst of mercy, the midst of grace, the midst of love, the midst of forgiveness and the midst of acceptance. I love that word amidst. It means to be surrounded by. I am surrounded by my accusers or I can be surrounded by Jesus. It is my choice really.